Planning your best friends stag do can be a big task. But making sure you give your pal the perfect celebration before they say ‘I do’ doesn’t have to be complicated or stressful. We offer fantastic stag do packages that the whole party will love. Read on to find out how to plan the perfect Indoor Football Stag Party in Dublin with us! A big advantage is that our Indoor Soccer Dome is close to the airport, so you can get to us from a variety of places. In under 10 minutes in a taxi on 15 minutes on the bus, you will arrive at our state of the art soccer dome from Dublin airport. So if you’re worried about the large group you have to ferry around, you can relax, as you won’t have far to travel. Once we’ve welcomed you in, we can get you straight on the pitch to play a fantastic game of 5, 6 or 9 a side football. The stag will love doing something he enjoys and it’s a great way to break the ice between friends of the stag who may not know each other. Our state of the art indoor pitch means no mud, no injuries from studs and no bad weather; it is the perfect setting for a fantastic game of football. You don’t have to limit your activities to football. We offer a range of activities that are great fun and will make the perfect stag do activity. Extra activities include tag rugby, ultimate frisbee, segway and polo segway. Let us know if you would like to take part in extra activities and we will organise it for you. No stag do would be complete without a drink or two! Our clubhouse bar will be open ready to serve you drinks after your activity is over. We can even arrange transport back to your accommodation. If you want to make the most of the day, why not arrive early for a Full Irish breakfast. A great way to fuel up before the day ahead and you will get the full breakfast works; bacon, sausages, black and white pudding and so much more. If you arrive for lunch time, you can opt for our delicious carvery lunch instead. Just let us know! After your football filled day, why not continue the stag party in to the night. We are just 20 minutes away from Dublin’s lively city centre; a popular spot for stag parties that is bursting with bars. There are over 600 pubs to choose from in Dublin, all with different styles to suit your stag party! How much do our Stag Parties cost? Prices are from just €12.50 per person (bargain! ), which includes 1 hour of football and a jumbo Irish breakfast with tea/coffee and toast. You can add on more football time or activities for an extra cost and drinks at our ClubHouse bar will also cost extra. Our stag parties are completely affordable and we will help you make it a perfect party that the stag will always remember! Of course, we don’t only cater to stag do’s! If you’re planning a hen party for a football loving bride, why not enjoy the party at our state of the art soccer dome. We will help you to plan the perfect stag or hen do to suit your group, so all you have to do is turn up and enjoy! 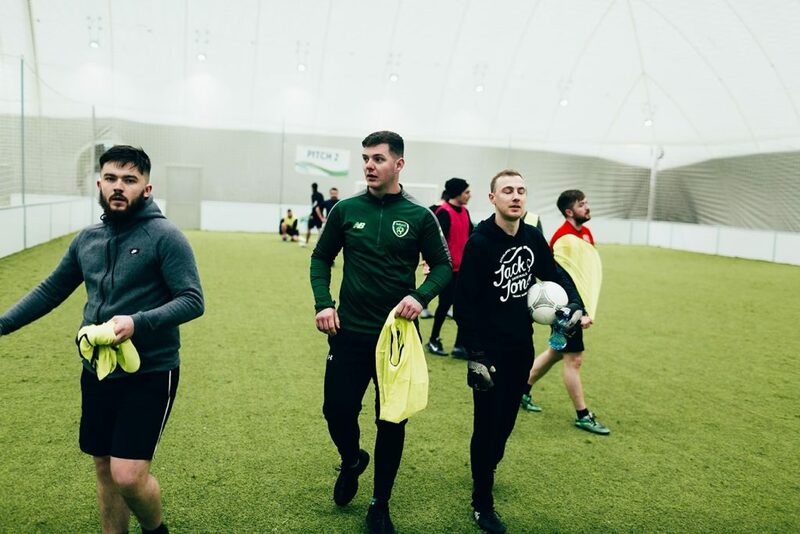 Find out more about our indoor football stag parties in Dublin here.